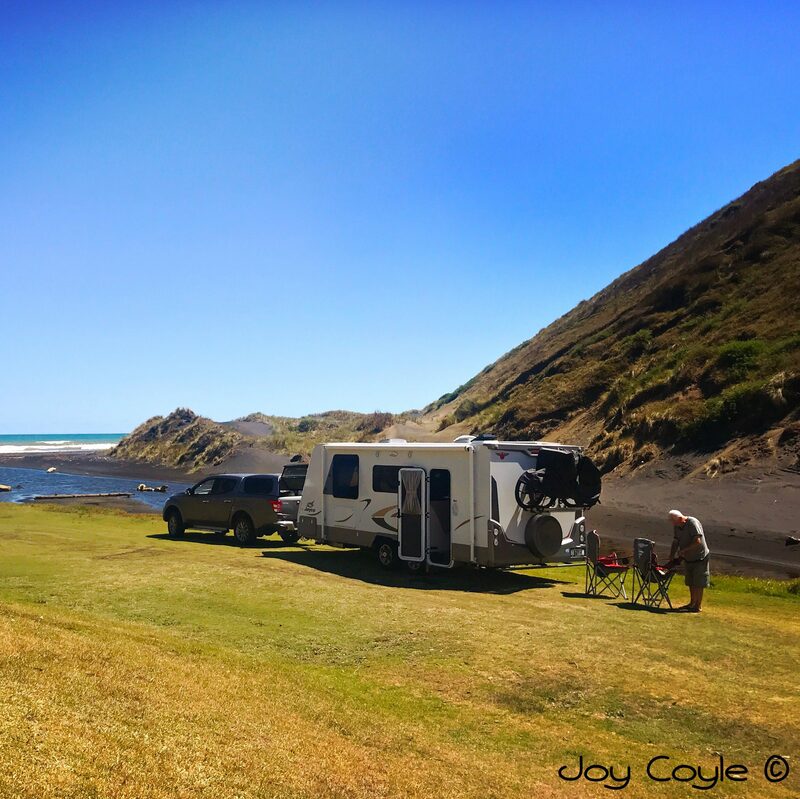 It’s been a little while since my last post on Port Waikato, and I’m going to skip forward a little to the beginning of last week when we left Taupō on a trip to Taranaki. We decided to go as far as Mangakino the first day, and parked up at the freedom camping site on the banks of Lake Maraetai, a man-made hydro lake on the Waikato River. It’s called Matekuri Island (#3266 NZMCA), though it’s not really an island. Accessed down a short unsealed road beside the golf club just past the parking area of the lake boat ramp. It’s a large flat grassy area, so there’s plenty of room. The popular Bus Stop Cafe is situated about 400 metres away back at the main lake car park where the boat ramp is, and behind that, overlooking the lake, is another freedom camping site, also quite popular. We bought Memphis Bar ice creams here and sat and enjoyed the afternoon sun while we watched the goings on, as you do. It was very peaceful and pleasant. Next day we set off for Otorohanga NZMCA Park where we spent a couple of nights. This time we planned to go to the Otorohanga Kiwi House and Native Bird Park, instead of just passing through the town without seeing it’s attractions. It’s been many years since our last visit to the park. It was then in it’s very early stages of development. It’s lovely being able to get up close to the native birds. These are just some of the many birds to see here. The complex also has a huge fully enclosed atrium where a path leads us through native New Zealand bush, with birds flying freely, and splashing in the streams, and tuatara camouflaged in the undergrowth. And then there’s the kiwi house where we are unable to take photos as the light is controlled. During our daytime we see them in their natural habitat as if it is their night time, and camera flashes would disturb them. During our night, special lighting gives them a day time when it is their natural time to sleep. Successful breeding programs for kiwi and other native species have been operating here for many years. And educational opportunities for schools and the public are encouraged. Feeding times for the various species throughout the day are on the board. Visitors can choose to be there if they want to watch, and learn, as the staff member gives an informative talk about the species. We struck a crowd of students from Karangahake School there. They looked to be thoroughly enjoying it. We were glad we’d revisited. Next stop is Tongaporutu to see the Three Sisters. Great photos. Particularly liked the one of your caravan at the camping site, (great clouds) and the photo of the ice cream. Thanks Cliff. It’s a good spot for an overnighter.